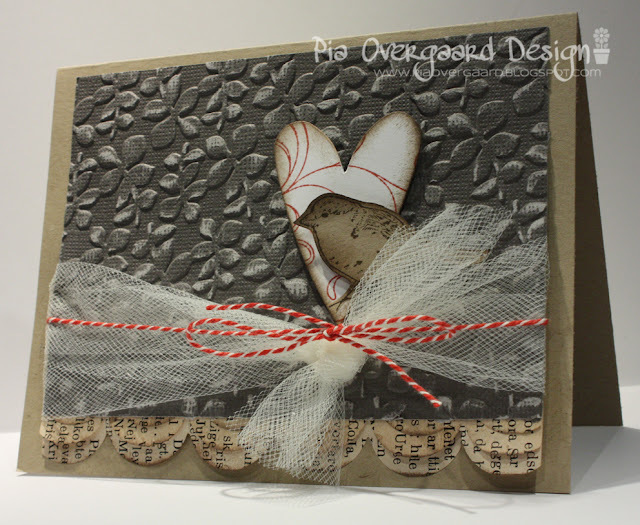 Yesterday at Lily Pad Cards there was a new fun challenge - all about textures! Textures are fun and anything goes - really! I used some core'dinations paper which I embossed for my first card and some tulle to create some extra texture. I was inspired by the look & feel of this image from Pinterest. 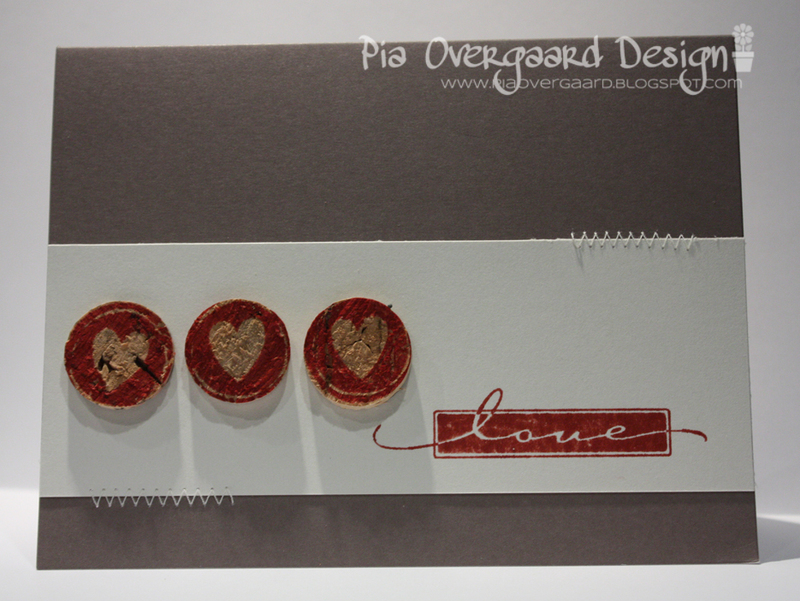 For my 2nd card I used some wine cork on which I stamped hearts and applied to this CAS design. 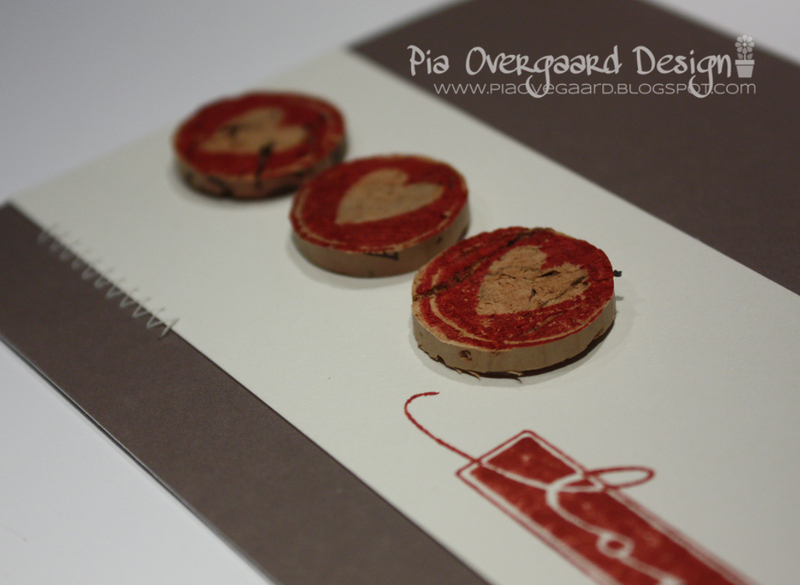 The cork makes a fun texture I think ;) I can see this be used for many designs also as embellishments on scrapbook pages. Hero Arts layering paper, distress inks. Don't forget to check out the challenge - you'll have a change to win a lovely gift certificate from Simon Says Stamps! Hvor er de smukke og elegante... skønne farver og så fin med det røde kontrast. Jeg har set dem på Lily Pad også... når man siger texture... er det så bare noget som er præget på den ene eller anden måde, så som proppen. 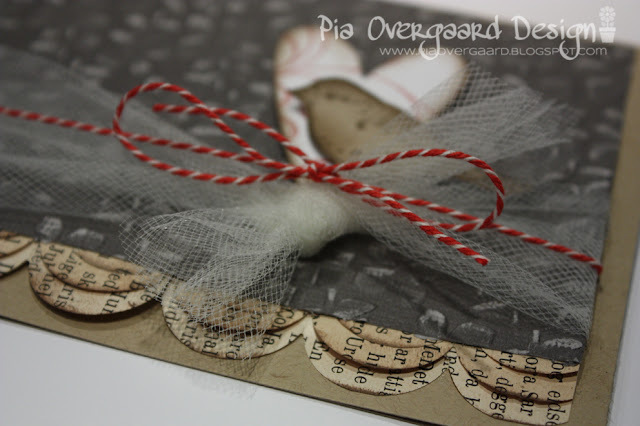 Love both of these, Pia -the bird and text especially on your first, with that wonderful pop of the red twine, and what a wonderful idea to stamp on cork!! Beautifully done! These cards are lovely Pia, great texture on both of them , I love your newsprint scalloped border!! Absolutely gorgeous, Pia! Love your creations for this texture theme! Lots of great texture on these cards! I especially love your use of the tulle. Absolutely stunning work, Pia! Wow, both cards are so pretty and love the soothing colors!